This Massage and cosmetic oil is created on the basis of Ayurvedic oil Sattva Olyana with the addition of rose oil (Rosa centifolia). The healing properties of roses have been known since ancient times. In the East, the rose is used in the treatment of many diseases. Oil massage with Sattva Olyana Rose has the following effects: antidepressant, antispasmodic, antiseptic, sedative, tonic, deodorant. It also helps in tachycardia, asthma, insomnia. 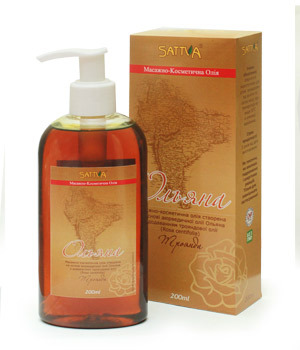 Massage and cosmetic oil Sattva Olyana Rose is an excellent tool for skin care: fragile capillaries, dry skin, cold sores, wrinkles. It tones the skin and tissue. Sattva Olyana Rose is Non-toxic & does not cause irritation and allergic reactions. How to use: Using Sattva Olyana Rose is a very simple process. To begin with, wash your hands and clean and dry the affected area. Now, take a small amount of the herbal oil onto the fingertips and apply it on the pain affected area. Massage by working in a circular motion till the oil is absorbed completely. Warnings: Sattva Olyana Rose is for external use only!